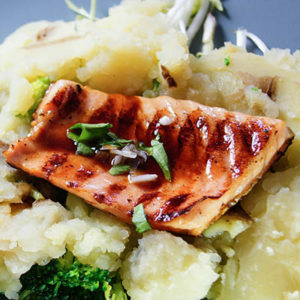 Before you head out for the day, put salmon fillets in a zippered bag with a half cup of soy sauce and a cup of maple syrup. Toss in a handful of chopped scallions. Let them marinate all day in the fridge. When you get home, drain the fish, heat the grill and cook the fillets, but take care; they cook very fast. This is a must— squeeze some fresh lime juice on when you serve them. Crazy delicious. And when you do, report back. Thanks for listening!